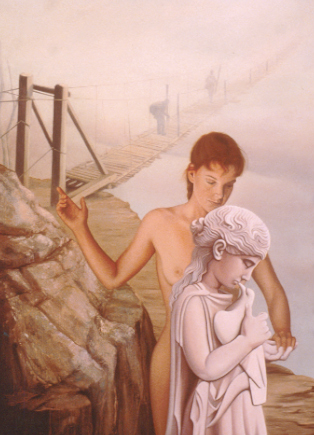 Gloria Joy calls this painting of hers ‘Faith.’ I also call it ‘the Call’ or ‘The Bridge into the Unknown’. When we answer our call, we’re usually acting on faith, because we’ve probably never been in this situation before. We’re acting on an inner impulse. It doesn’t make sense to our rational mind. But, somehow, we know something is afoot. First of all, some background about the painting. It’s most likely set in Nepal. Having been on a three week trek on the Everest approach trail and trekking up to about 12,000 elevation to Tangboche Monastery, I crossed several bridges similar to this one. In the High Himalaya, there are no bridges as we know them, and the mountain roads, or paths are literally trails worn over hundreds of years by the daily life of the Nepalese, trekkers, and pilgrims. The bridges, connecting two high mountains, are structures of steel cable bolted into the rock on either side stretching over a deep abyss often with a cold mountain stream rushing through the fog hundreds of feet below. These are not stationary bridges. Winds swoop through these high mountain passes causing the bridges to sway. The bridge, formed by planks placed between the two cables, is prone, over the years to lose planks. As I would cross, I prayed that there were no missing planks to make the journey even more perilous. Newcomers, like myself, cling desperately to the cable ‘railing.’ Nepalese walk boldly across. Even into the fog. This is the setting. The young flesh and blood woman symbolizes our inner soul or self—living, breathing, and alive. The stone child, clutching her toy, represents that immature and scared aspect, of whatever age, that is being called to go forward in life, that’s receiving a call. The child is afraid to look the soul in the eye, scared to have faith in the soul to follow the finger that’s pointing the way. In fact, the child doesn’t know how to have faith. It’s an unknown venture because we haven’t yet experienced that our soul always has our best interests at heart…even though the way may be difficult. If she met the eyes of the soul, she would have to answer ‘yes.’ So, she avoids contact and clings to the narrow strip of known territory on the side of the mountain, even though it isn’t totally safe. The thought of going onto such a bridge across such an abyss into totally unknown territory is more than she can possibly imagine. However, if she continues to cling to what feels like safety, she’ll miss the fullest adventure of her life. She’ll have a life, but not experience the fullness of all she could be. She’ll never learn to trust the inner voice or learn she can count on the Soul. Our fear is that we can’t handle the unknown. We’ve forgotten that we’ve met new situations, again and again, never knowing for sure we could handle them. We begin to remember that in the beginning everything is new and unknown. Something within us teaches us what to do, again and again. For instance, have you ever known what a given day would be? What a walk in the park, or the first day of kindergarten, or first grade, or first day of college, or getting married, or taking a trip to a foreign land was going to bring forth? Or even a trip to the coffee shop? Even when we have some degree of what we think of as control over a situation, we have no way of knowing what we’ll encounter. The outer, as well as the inner world, offers amazing opportunities. Gradually, we gain confidence in our ability to handle whatever shows up. We gain this confidence with practice. We get practice when we say ‘Yes’. Saying “Yes’ commits us to the journey, even when we’ve forgotten we once said ‘Yes’. • Are you willing to become more conscious about what’s going on in your inner world? • Are you willing to individuate, that is, become more of who you truly are, not what your family, culture, or the ‘let’s play it safe’ parts of your own psyche want? • Are you willing to engage the transformative journey of opening to The Mystery? To receive the inner help, we have to ask and take the first step. Once you hear the inner voice, I’ve found it helpful to remember what the inner voice sounds like or feels like interiorly, so you’ll recognize it when it comes again, as it will. Answering a call means you’re willing to take another step toward your destiny. In the beginning it may be more difficult to say ‘Yes.’ Later, as you recognize the ‘inner sound and feeling of the voice’ and recognize ‘the familiar tug at your very being’, you ‘get it’ that you might as well say ‘Yes,’ because the voice is creatively persistent, almost nagging, and won’t let up. It seems that when we don’t say ‘Yes’, that it turns up the heat to get our attention, offering, shall we say, a certain encouragement so we’ll ‘pick up our pack and begin to walk,’ begin to walk into the great unknown led by the Mystery of Life that yearns for our highest and most fulfilling development. We have inner resources we don’t know about until we need them. Brugh Joy often said, ‘When you step into the arena, resources appear.’ We gain trust as we check this out along the way and find we can explore the unknown, and survive, even thrive. Carl Jung said that when he experienced sudden, abrupt and unsought-for changes that redirected his life, he knew that the hand of the Divine was involved. And that he best put himself in accord with it. You’ll perhaps begin to feel as I do. At the bottom line, I don’t know how all of this works; however, when I ‘get’ that I need to take a step, and I’m willing to move forward, I experience that somehow I’m connected to some greater force of the Universe. Things happen-little things and big things-that move me forward. I ask for help. Answers come. The direction becomes apparent. I feel like a pawn on the Universe’s chess board and I’m moved to where I need to be to take even the next step, so I can live to the fullest… even when I don’t know that is or where I need to be! And I always find I’ll have something to stand on, or I’ll be taught to fly. My soul’s journey engages me.